FREE Christmas Tree Garland Crochet Pattern. After crocheting this granny scrubby dishcloth I realized that Red Heart Scrubby Sparkle yarn had a nice holiday sparkle to it. 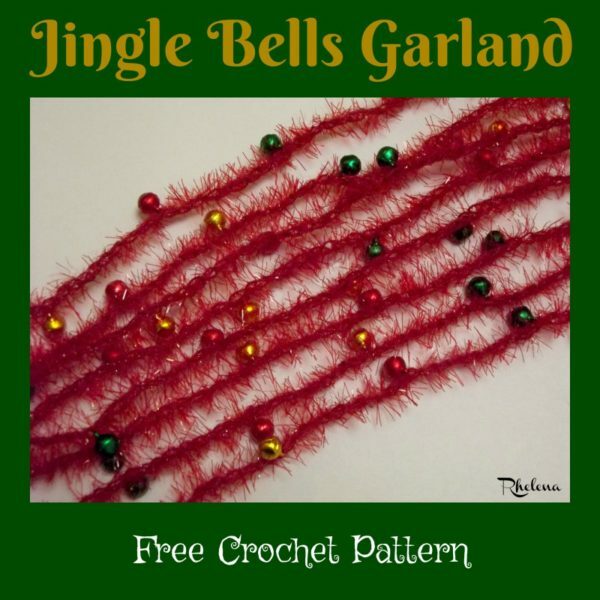 As a result this cool jingle bells garland came about. It’s simple to crochet. And I want to say that it’s quick too, but I found it quite time-consuming to string the bells and keep sliding them down. The beauty though is that you can crochet this to any length that you want, making it great for all tree sizes. And it’s not just great for trees, but you could also try it with multiple strands over the fireplace, a doorway; or wrap it around your holiday wreath. Gauge: Approximately 2.5″ over 10 chains. To help save some time, string about one third of the bells and then cut the yarn and string on the next batch. Then tie the yarn and continue. String your bells onto the yarn. Make a slip knot and slide 1 bell up to hook, *chain 10, slide 1 bell up to hook; repeat from * until you get up to your last bell; chain 1 to secure last bell. If you need a longer garland string more beads and continue. Fasten Off once you reach a desired length. 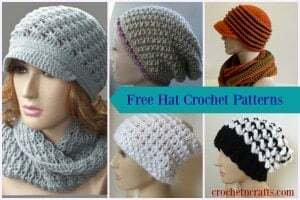 Visit CPB for more FREE Christmas Crochet Patterns.